You can take the Mountain Air road either from Pontypool or Cwmbran. If you’re coming from Cwmbran head towards Siloam Baptist Church, Upper Cwmbran, NP44 5AG. Get on the Mountain Air Road, follow it up the mountain until the road flattens out you will then see a turning on the left leading to a large car park. You can then walk up the mountain from there heading towards the TV mast on top of the mountain. Walk up time abound 15 minutes. Park in the parking areas, Lat/Long above. Walk past TV mast where you will find plenty of places to take off. The top landing area is a little tricky for hang gliders and needs careful planning. Watch out for the mast. Paragliders will find slope landing difficult because of the steepness of the slope, and the bracken cover. Bottom landing is difficult due to there being high trees at the bottom of the slope. During the first few hundred feet of height gain, watch out for turbulence from the trees below ridge level. In strong thermic conditions the air can become rough there due to the tree line at the bottom of the slope. 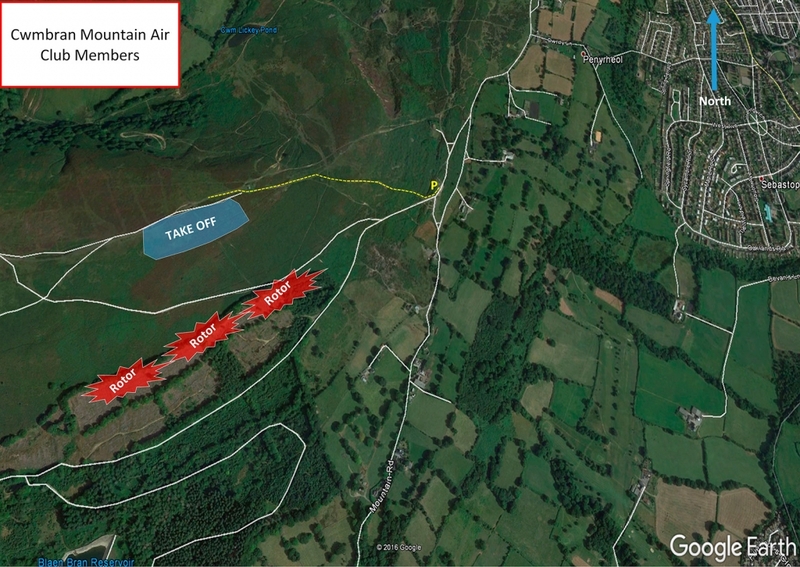 There is a clay pigeon shooting range behind the Mountain Air Inn on Sundays, look for the red flag. Mynydd Twyn-glas Mountain, 1.5km NW of Upper Cwmbran near the TV antenna.